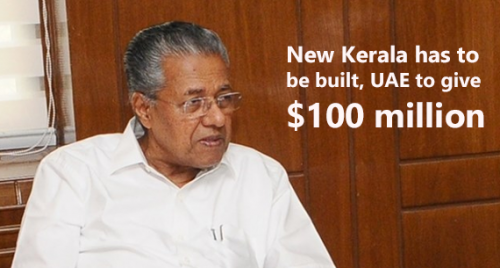 Thiruvananthapuram, Aug 21 : The UAE has pledged $100 million for flood-battered Kerala, Chief Minister Pinarayi Vijayan announced on Tuesday, adding "a new Kerala" needed to be built following the widespread destruction. "A new Kerala has to be built. At today's cabinet meeting, it has been decided to submit a detailed list to the Centre," he said. "Funds are the prime requisite for this. This will be raised by us through various sources besides getting it from the Centre and other agencies," he said. "The Kerala diaspora has been a huge source of help for us. Since they have done tremendous service in the Middle East, it has helped build good relations with the governments there. "Today morning, the UAE rulers informed our Prime Minister about their contribution for Kerala and this was conveyed to me by M.A. Yusuf Ali (who owns Lulu Supermarkets)," he said, thanking the Emirate for the timely help. Vijayan said they would ask the Centre to allow Kerala to increase the market borrowings from 3 per cent of the state's total revenue to 4.5 per cent. As a result an additional Rs 10,000 crore can be raised. "We have decided to approach agencies like NABARD whose mandate includes providing for infrastructure and drinking water. "We will demand a special package for the state," said Vijayan. Till Monday, the total contributions received to the Chief Minister's Distress Relief Fund was Rs 210 crore while another Rs 160 crore has been pledged.